The minute this recipe caught my eye in the November issue of Bon Appetit, I knew instantly I was going to make it, and SOON! The flavors were perfect for fall. There’s just something so delicious about cake made with brown sugar. These were almost coffee-cake tasting in flavor & texture. Believe me, you can’t get this flavor from a box. It was rich; dense but soft; and full of flavor. I have a love for salted caramel, you may have seen the birthday cake I made for The Boy back in March. It had a salted caramel frosting, with cream cheese in it. That frosting was a bit thicker than this one. In fact, this one, in my experience, was more of a drizzle type of frosting. I even added an additional cup of powdered sugar because it kept running! The frosting was sweet, but the fleur de sel to help cut the sweetness. It was a bit of heaven on your tongue. 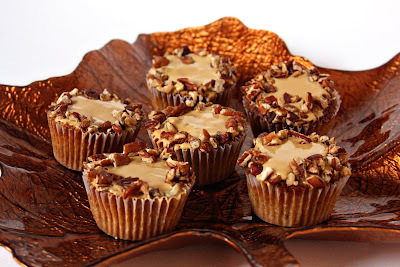 Now, while I LOVE the flavors here, I wasn’t crazy with how they held together as cupcakes. The frosting drizzled down the sides, and were a bit messy. This is a recipe I would love to make again, but in a different form. In my opinion, this would work better as a bundt cake or loaf, with the frosting drizzled on. That’s just my humble opinion. Again, these cupcakes were to-die-for in taste and flavor, so don’t look pass these up! Everyone at my family reunion kept asking “What’s in these? !”, and gave the cupcakes many compliments! Put rack in bottom third of oven; preheat to 350°F. Spray 12-cup muffin pan with nonstick spray; line with muffin cups. Whisk both flours, baking powder, baking soda, and sea salt in medium bowl. Stir in chopped pecans. Beat butter in large bowl until smooth. Add brown sugar; beat until light and fluffy, about 2 minutes. Add eggs 1 at a time, beating to blend between additions. Beat in sour cream and vanilla. Add dry ingredients; beat on low speed just to blend. Divide batter among muffin cups. Bake cupcakes until tester inserted into center comes out clean, about 23 minutes. Cool in pan on rack 15 minutes. Transfer to rack; cool. Can be made 8 hours ahead. Cover; store at room temperature. Stir sugar and 1/4 cup water in medium saucepan over medium-low heat until sugar dissolves. Increase heat to medium-high; boil until syrup turns deep amber, swirling pan and brushing down sides with wet pastry brush, 6 to 7 minutes. Remove from heat; add cream (mixture will bubble up). Stir over low heat until caramel bits dissolve. Whisk egg yolks in medium bowl. Very gradually whisk hot caramel into yolks. Cool to room temperature. Using electric mixer, beat butter and salt in large bowl until smooth. Beat in caramel. Add powdered sugar and beat until smooth. Let stand at room temperature until thick enough to spread, about 1 hour. Spread frosting over cupcakes. Place pecans on plate. 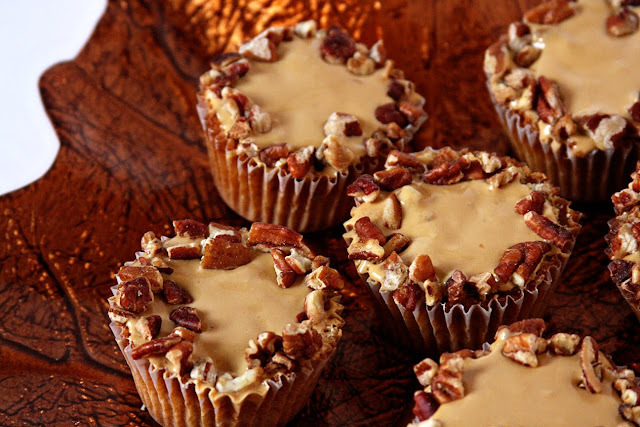 Roll edges of cupcakes in nuts. Can be made 8 hours ahead. Store airtight at room temperature. I haven’t been doing a great job at refreshing your memory as to what I was up to this time last year. Oops! Check out my October tag to see them all, but if you only see one, you really MUST take a look at these Pumpkin Cream Cheese Truffles! They were really REALLY good! This looks like a great combination! Man oh man, this is my kind of dessert. And your photos are amazing lately! Those flavors do sound delicious! I thought the same thing when I saw this recipe. I can't wait to make them! I was also eying this recipe. our version looks wonderful–I must give them a try. Cupcakes! I knew I'd get you over to the dark side. MUHAHAHA! I'm definitely starring this baby. The brown sugar pecan cupcake sounds amazing but maybe I'll change it up with a caramel swiss meringue buttercream since you weren't a fan of the icing. Yum! mmm I've been eyeing this recipe too! They came out great! This sounds like the most wonderful flavor combination. Perfect for fall! 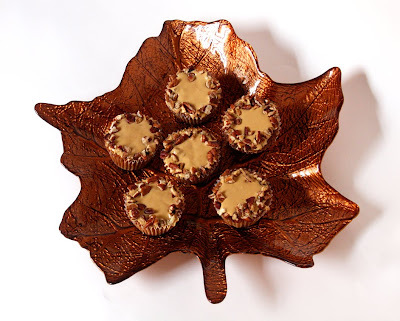 i love these and would love them even more as a bundt like u suggest. Oh how luscious are these? Love those photos too.